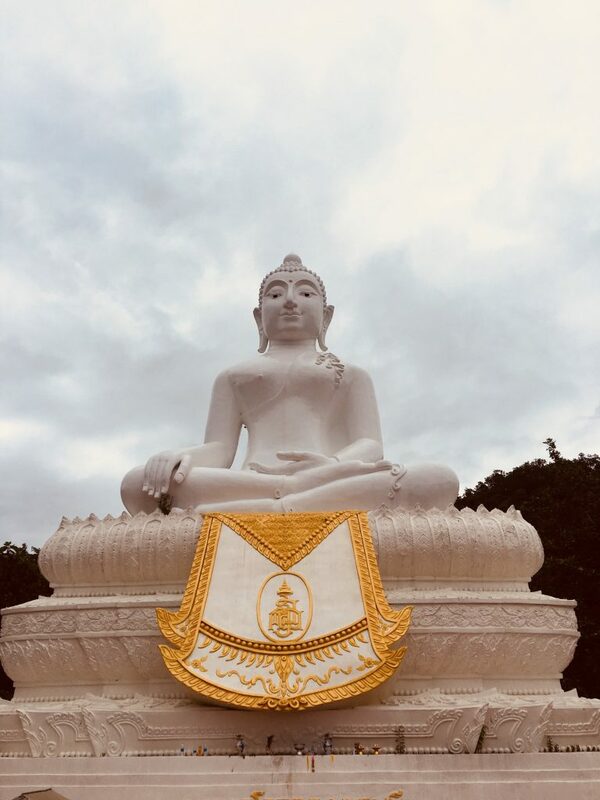 A massive white Buddha that can be found on the hill near Pai town centre. You can actually see the white big Buddha in Pai from most places around this epic place in Thailand. It stands out like a sore thumb due to its impressive pearling white structure sat on the green forest hill of Pai. 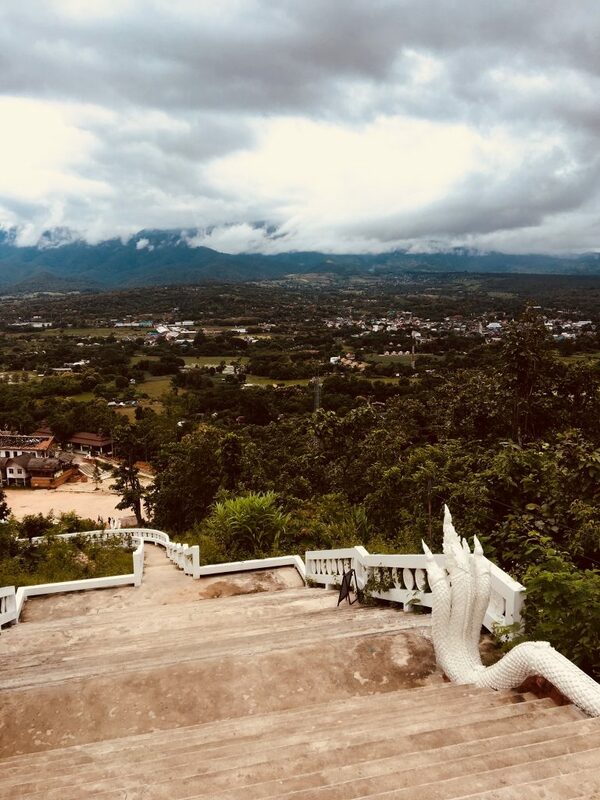 After visiting and finding out about the white Buddha history you can make your way to the Pai Canyon. Or checkout all the other best things to do in Pai. The big Buddha in Pai is probably the most touristic place in Pai. 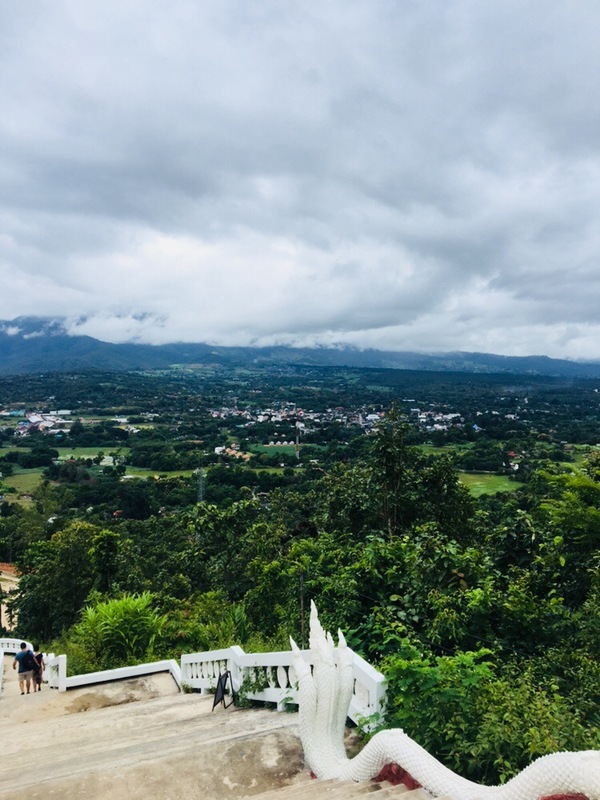 This is because you can see the most epic views overlooking all of Pai, also try to get to the white Buddha for sunset as you will get an amazing view of an illuminated Pai. This is going to give you an epic Instagram photo. Prepare to get your heart rate up! There’re 353 steps to climb to reach the top of white big Buddha. Don’t worry though it only takes 5-10 minutes to climb to the top, it’s worth a little sweat for the views. At the top I noticed locals praying to the big Buddha and there is spiritual candles lighted around the white Buddha. 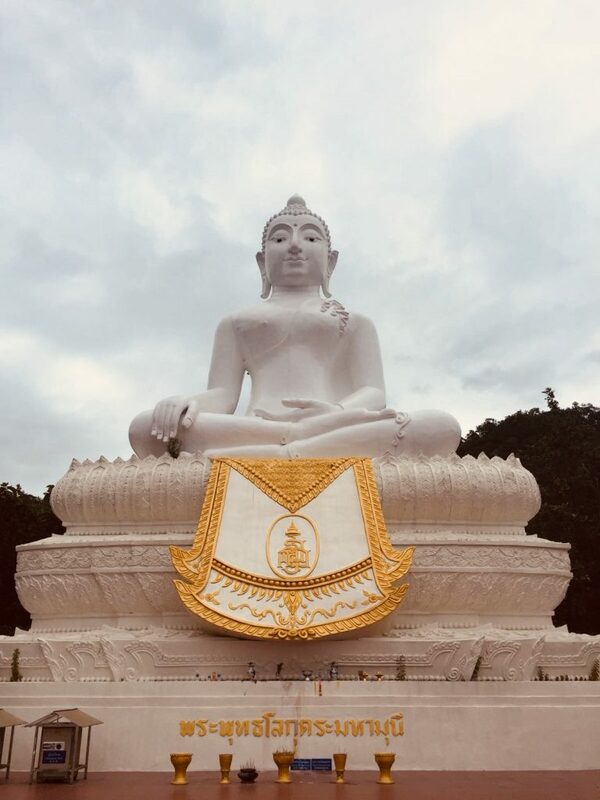 How much is the white big Buddha of Pai? The cost of the big Buddha is absolutely free, there is no entry cost. However, girls have to wear a sarong and it’s 20 baht ($0.70) to hire these. 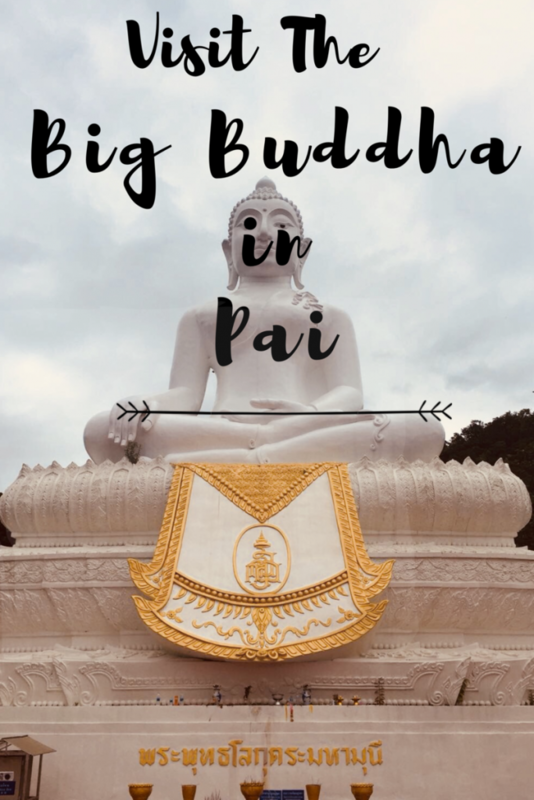 The big Buddha is only 2km from the centre of Pai, therefore you have a few easy option to get there. I hired a scooter for the day, which only cost 150 baht ($5) for 24 hours. It only take 5 minutes to get from the centre of Pai to the entrance of the white Buddha. 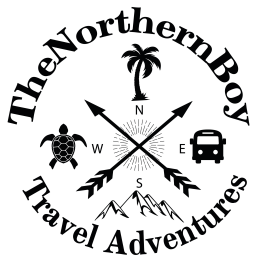 How to get to the Pai from Chiang Mai? You have a few option to get from Chiang Mai to Pai. However, you will need to do an overnight stay in Pai to fully enjoy your visit. I would highly recommend staying over for at least 2 nights in Pai if you have enough time. You should make your way from Chiang Mai to Pai, get checked into your accommodation in Pai and then head to the canyon. We made the journey from Chiang Mai with a hangover. The journey was s**t and I’ve never felt so ill in my life. The roads have so many twists and it’s a stomach turner. But don’t worry it’s worth it to visit Pai. Let’s have a look at your best options to get to Pai. Taxi – A taxi is an option for you to get to Pai. But this can be a little bit more expensive. We met two backpackers who had paid for the taxi there. This was because they was short on time and wanted to get from Chiang Mai to Pai quick. Your taxi will likely take about 3 hours. Scooter – This is a cool option if you are okay to ride a scooter round hundreds of sharp turns. The journey to Pai is not a straight road at all. It’s a constant snake road of twists and turns. Coach. The time depends on your driving skills, don’t rush though! The mountains between Chiang Mai and Pai get crazy. Plane – A plane from Chiang Mai to Pai is your quickest to get there. It’s just a 30 minute flight. This is will be your most expensive option. 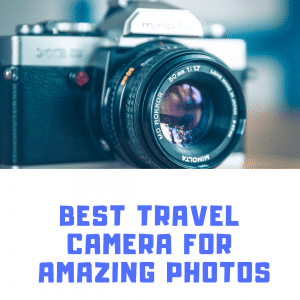 This option will suit those if you that are on a holiday or have a short visit to Thailand and really want to visit Pai. You can expect to pay around $60 for the flight. Mini van – This was the option we went with and it’s the cheapest. A mini van from Chiang Mai to Pai takes about 4-5 hours. You will do the journey with 6-8 other travellers. We found this way the cheapest and it’s the most popular to get to Pai. a scooter is the best way to see all the things to in Pai. You have the option to walk from the centre of Pai and this take between 20-30 minutes to get there. This option gives you a great chance to see more of the places to visit in Pai. I’d of done this option if I wasn’t in a rush to see everything because of my short stay in Pai. Girls have to cover up, this is with most places you visit in Thailand. 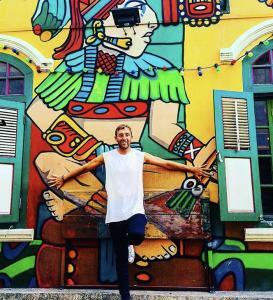 Not sure on what to wear for big Buddha in Pai? see the backpacking essential item list for Asia for more info on what travel clothes to take backpacking. Don’t kiss at the top. Kissing at the big white Buddha is completely frowned upon. Take your shoes off at the top, the floor is shining white so we don’t want to muck this up. Be respectful around the Buddha . No shouting and disturbing the locals praying. You will never struggle to find a place to stay in Pai. The number of guesthouse in Pai outnumbers the local private houses. The hostels in Pai are in a great location right next to centre. There’s also luxury accommodation in Pai which can be away from the centre in the quieter hills. Therefore, it’s what ever type of trip to Pai you’re on, there is plenty of places to stay in Pai.